This past Sunday evening, LA Travel Magazine hosted their signature event- Taste of the World. 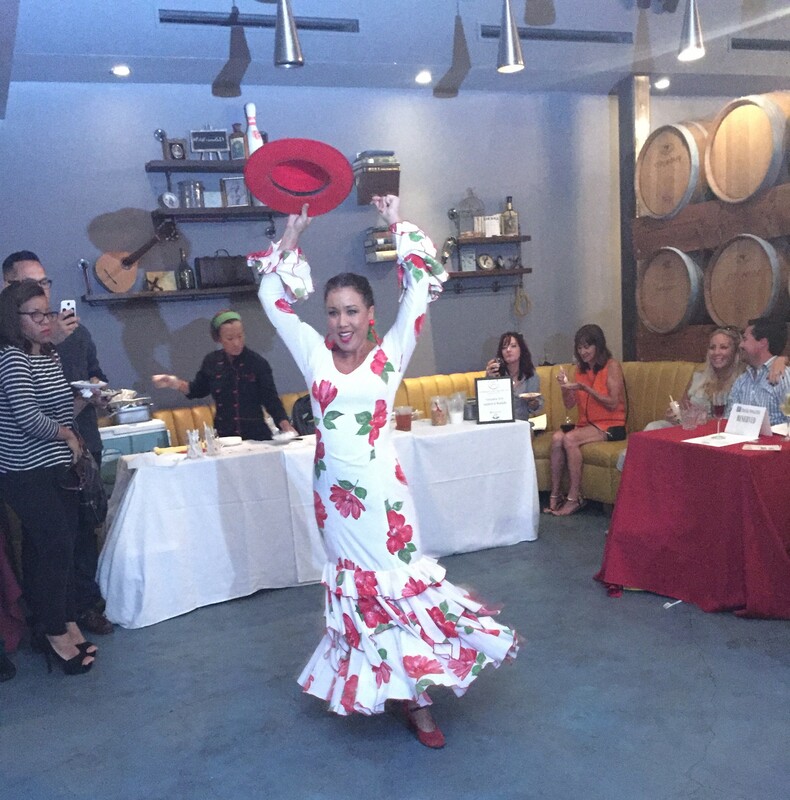 Their goal in putting on this great event was to celebrate food, wine, and culture inspired by International travel. There, we met food and wine connoisseurs that traveled in for the event from all over California in order to partake in this event showcasing some of Southern California’s most prominent chefs. 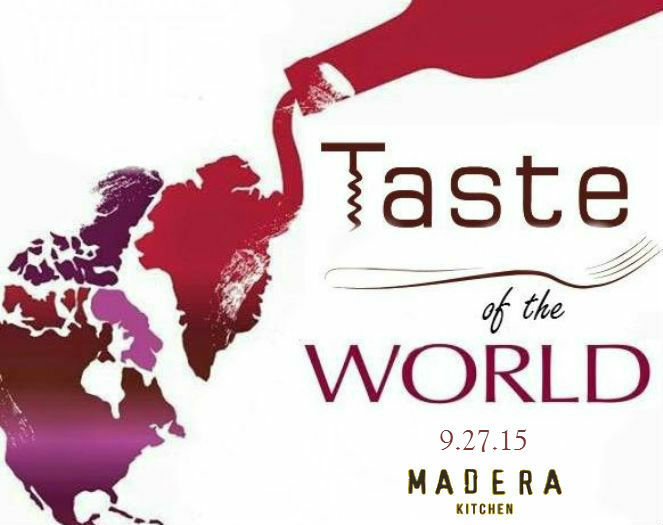 Taste of the World was held at Madera Kitchen & Bar, a very trendy establishment in the Hollywood area. The establishment had a very cute ambiance with an outdoor fire place, a great balcony area, and wine barrels acting as decoration, creating the perfect place for a nice dinner. Attendees signed in and received the menu for the night. 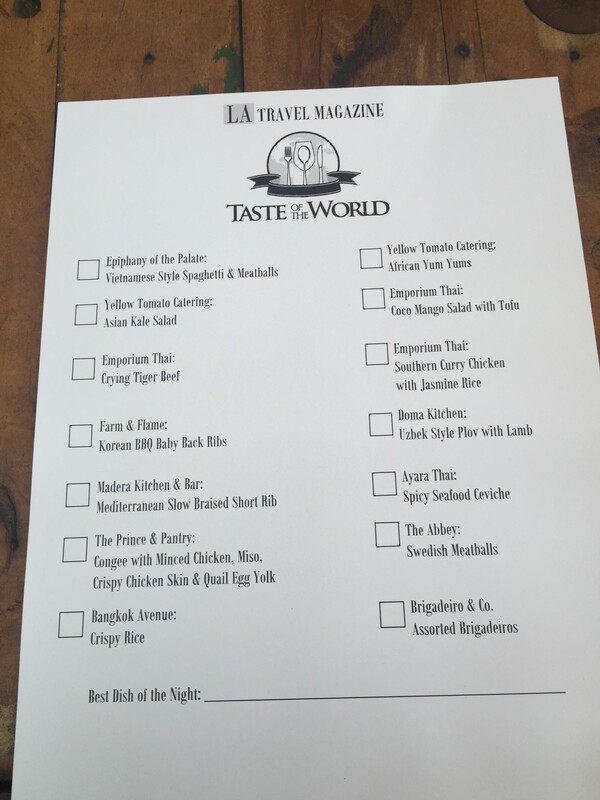 However, this wasn’t your typical menu. Instead of picking one or two dishes to try, guests were going to sample everything on it! Restaurants were represented from all over the area showcasing their specialties. One was able to walk around and try it all, which resulted in treating your stomach with a feast of food from around the world. Guests were not just there to enjoy though, everyone attending got to act as a food critic for the night. Using your personal menu, one would keep track of everything they had tried so far. After completing the rounds, you would vote for your favorite dish of the night. Fourteen restaurants took part in the competition. See menu for a list of each place and what they were serving. After trying all the dishes, we had a couple favorites. Epiphany Of The Palate– Epiphany Of The Palate was serving spaghetti and meatballs. Sounds pretty basic, right? Wrong. This was actually a Vietnamese style spaghetti and meatballs, which tasted nothing like the kind we are accustomed to eating. In fact, we found it much tastier. 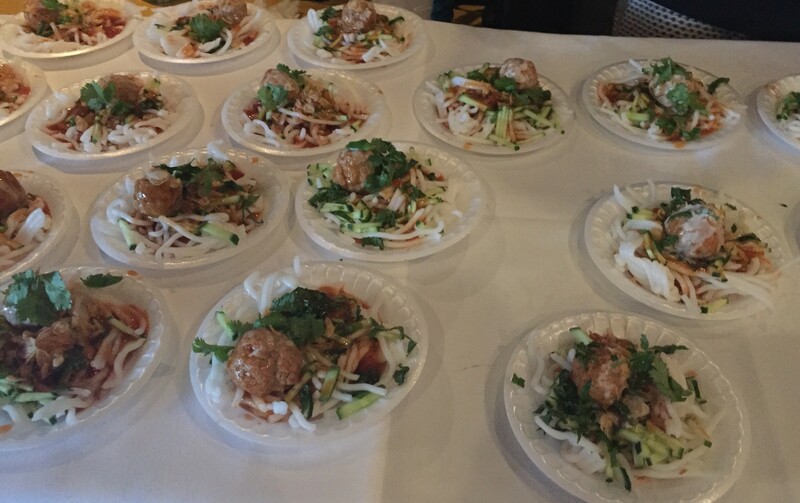 The specially prepared noodles went perfect with the meatball they served, and we were left wanting even more! Farm & Flame– Farm and Flame served up the most delicious ribs we have tried in a long time. These were Korean bbq baby back ribs, which were cooked to perfection with the perfect sauce and seasoning to accompany them. 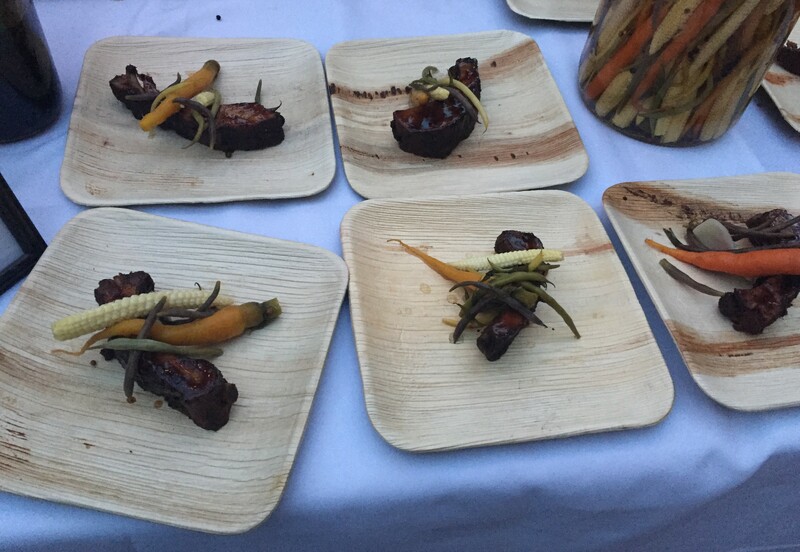 The Prince & Pantry– While there were too many superb choices at the event, we definitely had our favorite one. 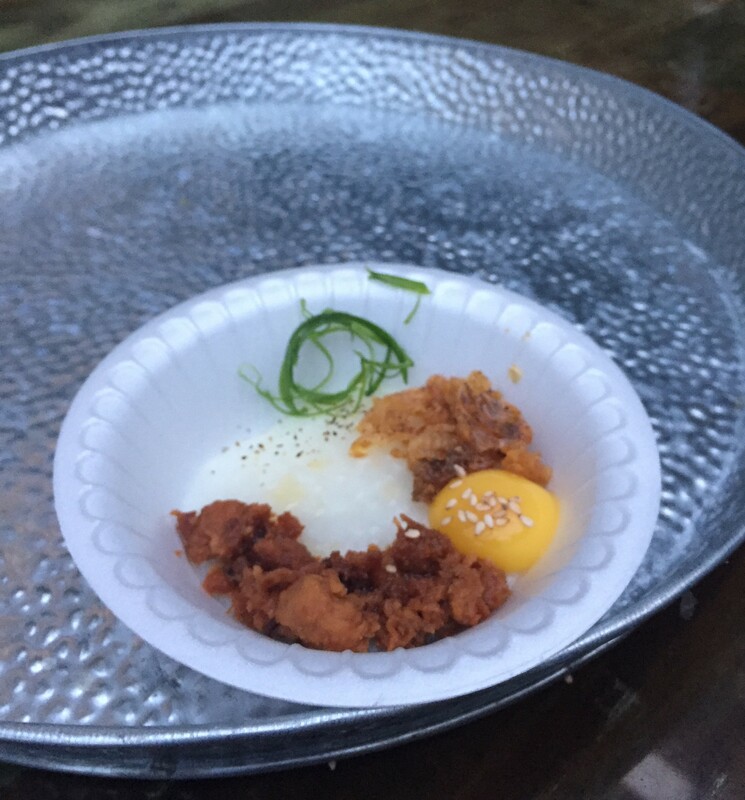 The Prince & Pantry was serving congee with minced chicken, miso, crispy chicken skin, and a quail egg yolk. They were all served together in a bowl. To eat it, you would mix them all together and then go at it. Having tried nothing like it before, we were astonished at how unbelievable it tasted. This ended up getting our vote for the night. The crowd all voted, and the winner was announced at the end of the night. Yellow Tomato Catering took home the award with their African inspired Yum Yums, a signature dish of theirs. If you like sweet potatoes, this was one you had to try. It was so sweet, you would have thought it was a dessert! Unlike many other food-festival-like experiences, Taste of the World had a much classier atmosphere, as everyone was dressed quite nicely. It was also a very intimate occasion, as only 150 attendees were allowed. This was the perfect number, as it never felt too crowded, and one was able to walk around and socialize easily. 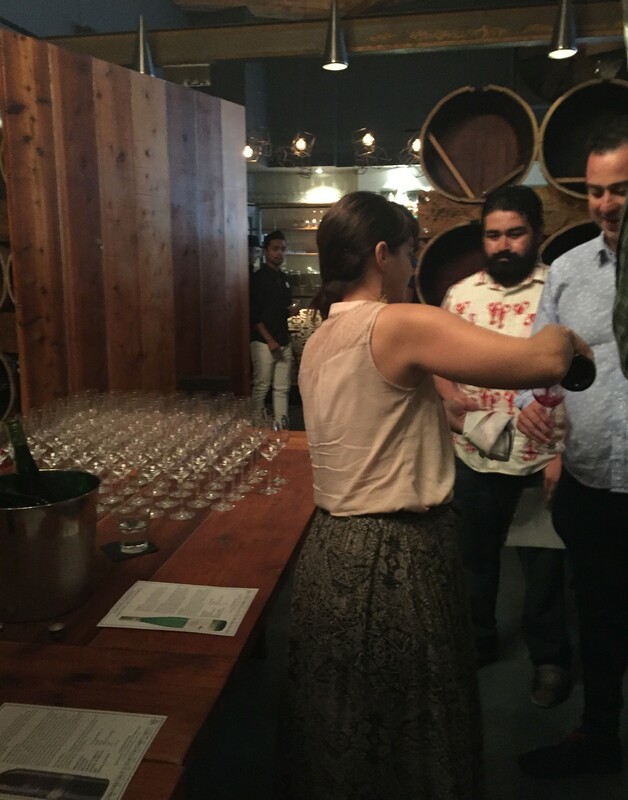 Besides all the delicious food there, attendees could also take part in a wine tasting. Wines were available to sample from all over the world. Quintessential Wines provided different bottles from Hungary, Italy, Chile, Spain and Australia. You were also able to learn all about the different wines that you were trying as well, which made it even more interesting. If wine was not your thing? No problem! 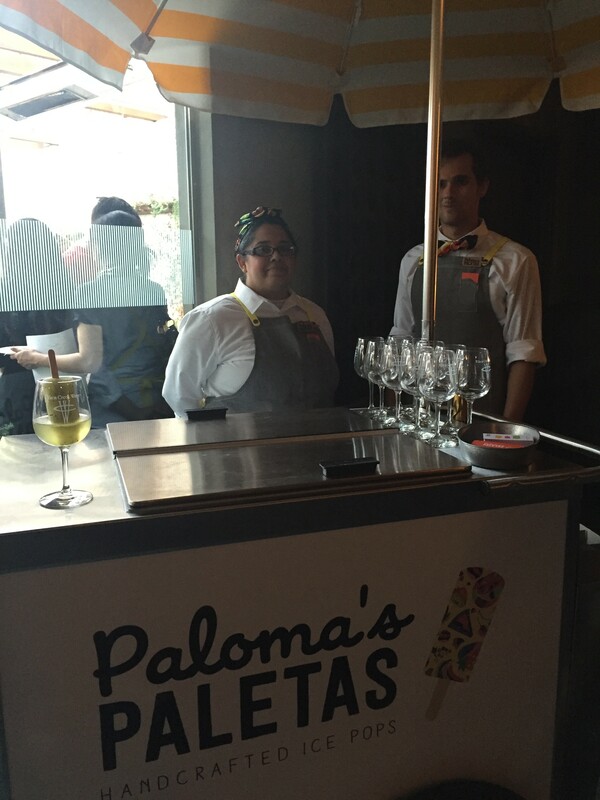 Paloma’s Paletas handcrafted ice pops had brought one of their trucks in. These weren’t popsicles for the kids though, as they were served in a glass of champagne! It’s not a party without entertainment, and there was definitely lots of this as well. Music was playing the entire time by DJ D-dub. Guests were also treated to multiple dance performances, such as talented samba dancers and more. Overall, the event was a complete hit. LA Travel Magazine, a publication that prides itself on informing travelers about the world, was able to show attendees cuisine and culture from around the world in their own Los Angeles backyard. Not only was the food and drinks topnotch, but guests left with much more than a full stomach- a better and fuller understanding of other cultures around the world. Taste of the World was a fantastic night for all, and we can’t wait to see what type of event LA Travel Magazine comes up with next. LA Travel Magazine is based in Southern California and is produced and published by AMG Media Group. It is the only magazine devoted to inspiring and informing Angeleno travelers through stories & photographs showcasing the world’s best luxury destinations & local travel experiences. For more information about Los Angeles Travel Magazine visit: LATravelMagazine.com.